Everyone knows that no matter how gorgeous and grand a cake can be, it still must taste delicious. But do you ever wonder how to tackle cutting a gigantic cake to find out? Want to serve a lovely layer cake for a dinner party dessert, but don't know what size to make for various party attendees? Well, fear no longer! 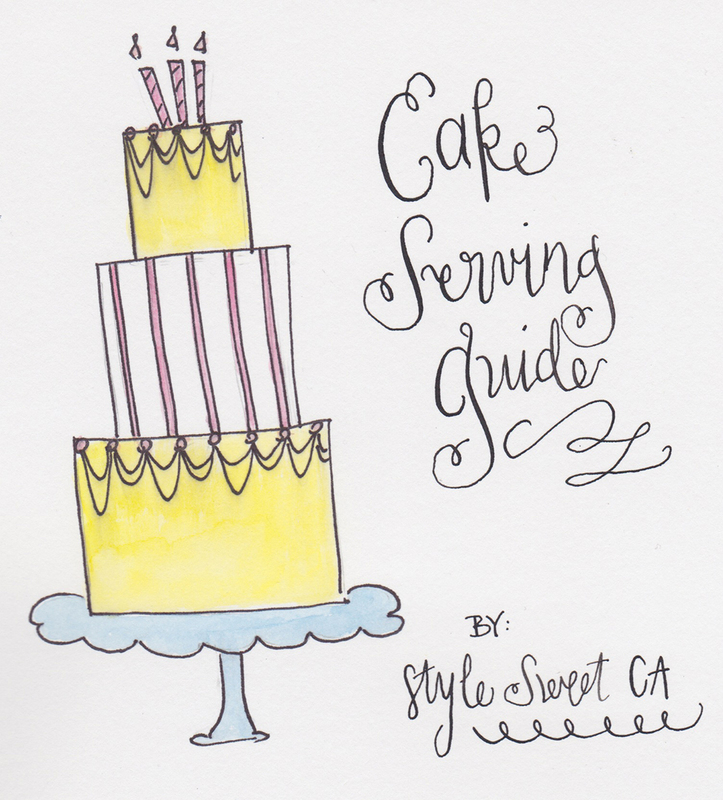 When it comes to determining serving size and how to slice into a beautiful cake with confidence, I've got you covered. I characterize "dessert slices" as those servings coming from a nice layer or sheet cake. Think birthdays, dinner parties, and bakery portion. These pieces are large enough to stand in for a whole serving of dessert. To start slicing a round cake, score the cake perfectly in half with the appropriate knife. From there, score the cake in the middle of one of the halves to create a quarter. From there, you should be able to eyeball this section to start creating even slices. Appropriate knife you ask? Most cakes should be cut with a chef's knife. Use a long serrated knife for cakes with fresh fruit filling or anything "crunchy," like a praline or nut filling. Most cakes are best served at room temperature, unless they have a custard or whipped cream component. For all other cakes, be sure to remove the cake from the refrigerator at least 20 minutes before serving. Tips: 1. Keep your knife clean in between slices. Your knife will probably start to pick up frosting and crumbs along the way, but be sure to wipe the knife down to keep slicing smooth as you go. 2. If you find the frosting of a buttercream or ganache frosted cake a little solid, run your knife under hot water to slightly warm the metal of the knife. Be sure you dry the knife with a clean kitchen towel before slicing. The piece of cake you might find at a wedding or large party will most likely not be equal to the thick wedge of cake a filling you would probably get at your local bakery. After cocktails, dinner, and dancing, it's no wonder these portions are a bit smaller. Thankfully most caterers and wedding venues will take are of the cutting for you, but it does not hurt to know a little bit of what's going on behind the curtain. Hopefully your wedding cake baker will assist you with ordering the right size of cake for your number of guests. If not, be sure to check out the chart above. These numbers are based off of 1 inch by 2 inch by 4 inch pieces. This is wedding cake standard, or at least something very close to what all bakers and caterers use. Before cutting, you will want to unstack the tiers, or at least the cake you are cutting at that time. To start, make a 2 inch cut from the edge of the cake. Using that as your guide, cut a 2 inch ring around your cake. Continue to cut rings around the cake until your reach the center. Slice the rings into 1 inch wide pieces. The cake is typically at least 4 inch tall, creating a perfectly portioned slice. For a visual of said "rings," check out this wedding cake chart.